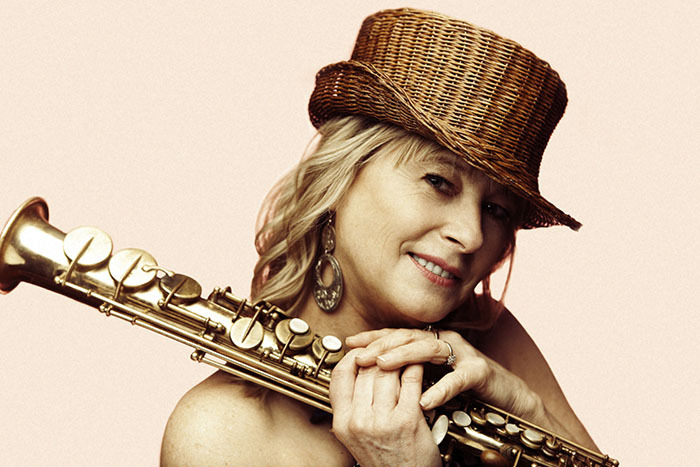 Four-time JUNO Award winner, two-time Grammy nominee, and Officer of the Order of Canada, soprano saxophonist/flautist Jane Bunnett has been chosen as a finalist for the Ontario 2014 Premier’s Award for Excellence in the Arts. The award, through Ontario’s Ministry of Tourism, Culture and Sport, recognizes extraordinary achievements of the province’s artists and arts organizations. The 2014 laureates will be announced at an awards ceremony at Roy Thomson Hall on Sept.16 in Toronto. Bunnett and her new all-female sextet, Maqueque, released their widely acclaimed self-titled album on the Justin Time Records label in Canada and sales are at a record high. The official U.S. release date is Sept 9. Among other bookings, the band will make a stop at NYC’s prestigious Blue Note Jazz Club, a stint at Markham Jazz Fest and will be wrapping up their hugely successful Canadian and U.S. summer festival tour with a final farewell performance at Hugh’s Room on September 27, before they return to Cuba. A musical force to be reckoned with and a national treasure, Jane Bunnett keeps busy creating music, touring and championing Cuban artists. A long-time jazz musician on the scene, Bunnett began digging deep into the music of Cuba during a trip there in 1982, and fell in love with its intricate, folkloric, Afro-Cuban rhythms, blending them with contemporary jazz sounds. It’s been an ongoing passion for Jane and her husband, trumpeter/producer Larry Cramer. Bunnett has been credited with introducing a lot of great Cuban musicians to North American audiences over the past couple of decades, including Dafnis Prieto, Yosvanny Terry, Pedrito Martínez and David Virelles. It’s her generous attitude in helping to boost the careers of fellow musicians, and her contributions to the cultural diversity and vibrancy in the music community, paired with plain hard work, that has garnered this latest award nomination to finalist status. Jane was also a finalist in last year’s award nominations. Bunnett’s latest project is an assembly of all-star Cuban musicians, a sextet which includes herself and five extraordinary young women. Together they create a dynamic and hard-driving sound that should stifle any naysayers from the boys’ clubs of jazz or Cuban music. Jane Bunnett and Maqueque (pronounced Mah-keh-keh), have been touring North America all summer, with their finale concert scheduled for September 27th at Toronto’s Hugh’s Room. Maqueque band members are Jane, on flute and soprano sax, virtuoso drummer Yissy García, dynamic powerhouse vocalist Daymé Arocena, Célia Jiménez on bass, vocals and bassoon, pianist Dánae Olano, and Magdelys Savigne on batás and congas. Artists and arts organizations practicing any professional arts in Ontario can be nominated for the Premier’s Awards for Excellence in the Arts. This includes visual arts, dance, music, theatre, literature and cultural industries, such as book and magazine publishing, digital media, film, television and sound recording among other artistic endeavours. The Ontario Arts Council chooses a jury of peers to review and assess every nomination. Twelve finalists have been chosen with six from the artist category and six coming from the arts organization category for this year’s awards. Supporting artists and arts organizations is part of the Ontario government’s economic plan to invest in people, build modern infrastructure and support a dynamic business climate. “Jane Bunnett and Maqueque is another solid and enjoyable addition to the large and impressive Bunnett discography” ~ Exclaim!